Three-Vehicle Crash On I-95 Kills Eight And Injured Several Others | Schuler, Halvorson, Weisser, Zoeller & Overbeck P.A. A construction vehicle hauled by a large tow truck hit the 10th Avenue North overpass on Interstate 95. 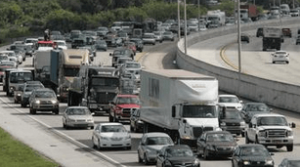 The crash damaged the bridge, snarled northbound traffic on the highway and shut down all eastbound lanes on 10th Avenue North, authorities and Florida Highway Patrol officials said. A spokeswoman for the Florida Department of Transportation said, a combination front-end loader and backhoe struck a beam on the overpass. The backhoe was extended upward and that’s what damaged the concrete beam, she said. Three other vehicles were involved and there were eight people killed in the crash, according to a Florida Highway Patrol spokesman. Injured victims were taken to Delray Medical Center. After the crash, three northbound lanes on I-95 were closed and eastbound lanes of 10th Avenue North were also closed for some time as inspectors and structural engineers looked over the damage to the overpass. Additionally, there were debris from the concrete beam spread across the roadway. A Florida Highway Patrol spokesman said, at no point was I-95 completely closed.